My wife made this yummy quinoa salad a couple of days ago. It was so good that I wanted to post the recipe here to share with everyone that loves great tasting food that is also really good for you. 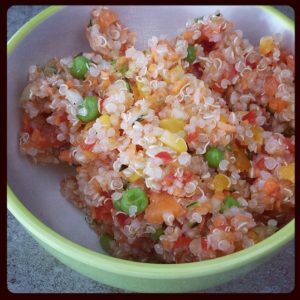 I am not sure if you are aware but quinoa is really tasty and just as easy to make as rice is. Full of nutrients and has a bit of a nutty flavor (to me anyway), and you can eat it either hot or cold. This recipe can be eaten either way. Cook the quinoa according to the directions and halfway through cooking you add the frozen corn and peas. After the quinoa is cooked let it cool for a bit. As it is cooling you can cut up the carrot, celery, onion super small and then mix them all together with a bit of the red thai chili sauce (careful it’s spicy). After it is all mixed together you can put it in the fridge until you want to eat it. Easy eh? This stuff is fantastic. I loved it.